It's great to feel like something you've dreamed about and planned for is actually coming to fruition - and being successful. That's exactly the way I felt at the end of the first session with my ladies at Naomi's Nest. A great reminder posted on the wall of our meeting room. When we met last week there were plenty of different things discussed. One of the ladies spoke up loud and clear. She needed a resume. She was determined to get a job upon her release from the program, and she wanted to be sure she was prepared. I assured her I would find someone who would help her create a resume. After asking a few friends and having no luck, I took to social media. Still no luck. No one was willing to volunteer their services. An acquaintance of mine shared my Facebook post, though. And lo and behold, two wonderful women raised their virtual hands to help out. After a few messages back and forth, only one person was available to meet me at Naomi's Nest and work on the resume with my Bridge Program Beauty. Aside from Kim, the resume angel, coming to our next session, one of my besties, Monique Dooley, came to speak with the ladies about health and wellness. Me and Monique - ready to uplift and empower! All of the ladies seemed to be in a great mood! Everyone came in and we all hugged each other. I introduced Kim and Monique to the ladies and they both got hugs as well. We then had a little recap and reflection chat about the week. I wanted to know how they were feeling and how they doing with the journaling. I was very happy to hear that they were enjoying the topics and the process of writing. Each of them felt that they fond it helpful to be able to write out their feelings. One of the ladies shared that the topics she liked most were the ones where she had to complete a sentence with her thoughts and feelings. Another noted that she liked writing her feelings before and then after writing. It helped her notice that her writing helped with working through some of her emotions. Nothing but positive feedback on the journals. AWESOME!! It made my heart smile as she discussed feeling her negative feelings fade away after journaling. Next, Kim went off to work on the resume with the lady who needed it and the rest of us settled in for Monique's presentation. She began by telling the ladies about her story of unhealthy eating and the health problems she experienced with it. That history lead her to make major lifestyle changes and begin to heal her body with healthier eating and lifestyle habits. 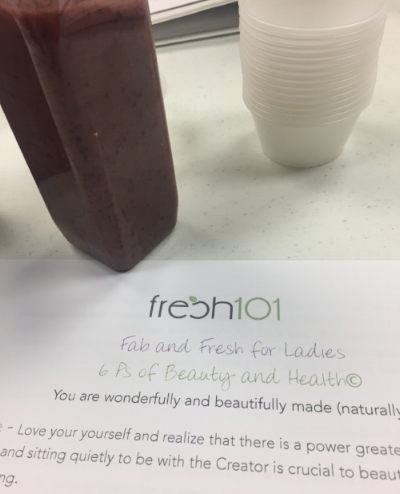 She shared her passion about lean eating and how those things came together for her to open her own business, Fresh 101, a Detroit-based juice bar that also carries smoothie bowls, soups, and other healthy morsels. The agenda for the day from Fresh 101. The ladies shared some of their health issues and concerns, and Monique suggested ways they could change some habits to help ease some of those worries. She let them know that worry, stress, and other negative thought patterns can contribute to some of the health problems they may be experiencing. To let them see how easy and delicious it can be to eat healthier, she brought a smoothie for each of them loaded with berries, mango, chia seeds and other goodies. She also brought one of her signature juices for them to try. To encourage the ladies to increase their water intake, she also gave each of them a slick water bottle. A beautiful mantra and our smoothies from Fresh 101! Before the day's session wrapped up, Kim returned with a completed resume and a beaming, dancing, and extremely happy young lady who was so confident she could find a job you could feel it in the air. She hugged both Kim and I - and I lost track of how many times she thanked us. Seeing how smoothly things worked out for her, the other ladies all voiced a desire to create or update their resumes as well. And Kim, like the Godsend she is, volunteered to return to help them all do just that. Kim and one happy lady - with a new resume! I gave the ladies a "you can do this"-"stay positive" pep talk for the week to come, everyone hugged each other goodbye and we went our separate ways. This is going so well! My participant with the new resume exited the program last week (I'm SO proud of her! ), so I will be down to five ladies instead of six. That's fine, though. They are are as enthusiastic as I am. Our next presentation will be from Crystal Gunn of the Amazing Woman Network, and she'll be talking to the ladies about money management, financial planning, and credit restoration. I'm blessed to be a part of this amazing process. To read about week 1 of The Bridge Program, click here. To learn more about The Bridge Program, click here. For more information on our upcoming FREE Journaling Challenge, click here.